I try to get out for a short walk before starting work each morning. A couple of days ago, my timing was such that it was just before sunrise touched Fernley itself, but just after it had reached points west of us. 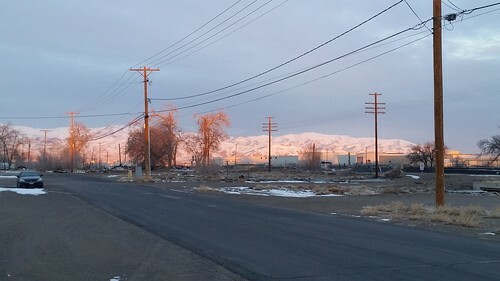 For just a few minutes, sunrise was reflecting off the snow-covered mountains to the west of Fernley before the sun actually climbed high enough to illuminate us on the flats. This photo doesn't really do justice to the striking view, but it will have to do.